3D-Computer Graphics with XNA, Chapter C1: Moving Triangles. File → New → Project → Win32 Project → Name: triangle1 → Location: C:\temp → uncheck Create directory for solution → Win 32 Application Wizard - triangle1 → Application Settings → Application type: Windows application → Additional options: Empty project → quit with button Finish. In the Solution Explorer - window Right-click triangle1. A drop-down menu appears with a branch: "Add". Click Add → Existing item... → C:\Program Files\Microsoft SDKs\Windows\v7.0A\Lib\OpenGl32.Lib → Quit with button Add. Check whether OpenGl32.Lib arrived in the Solution Explorer tree. In the Solution Explorer - window click the + sign in front of triangle1. A tree appears with a branch: "Source Files". 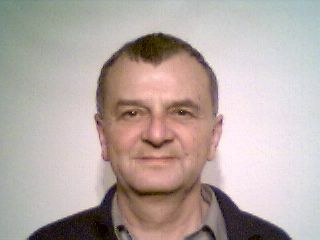 Right-click Source Files. A drop-down menu appears. Click Add → New Item... → Add New item - triangle1 → Visual Studio installed templates: C++ File (.cpp) → Name: triangle1 → Location: c:\Temp\triangle1 → Quit with button Add. 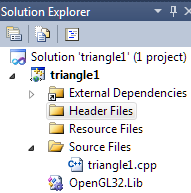 Check whether triangle1.cpp arrived under branch Source Files in the Solution Explorer tree. If the Solution Explorer - window is invisible, open it via the main menu: View → Solution Explorer. #include <C:\Program Files\Microsoft SDKs\Windows\v7.0A\include\gl\Gl.h> //adjust your path to Gl.h !